If you were expecting the summer issue sooner, I apologize. ‘Building History‘ was some time in the making. It’s a brief history of Mines through the lens of campus architecture (with a few digressions along the way) and it has been a lot of fun (and work) to put together. Amie Chitwood and I spent countless hours poring through thousands of old photographs and referencing dozens of historical documents. Deb Melani conducted interviews with individuals throughout Golden, including the campus architect, alumni and local historians, Rick Gardner was particularly helpful. Using records from the office of Capital Planning and Construction, we charted the growth of campus (total square footage of all buildings) 1874-2014, and graphed them alongside enrollment data that we cobbled together from three different sources. You’ll find the resulting graph interesting, but it’s only available online, there wasn’t room to include it in the print edition. The most exciting find was the photo featured on the cover, showing the original School of Mines building. For years, the only depiction I’d seen of the early campus was an idealized sketch of three stately buildings. The photo on the cover, donated last year to the photo archives of the Golden History Museum, where we stumbled across it, reveals a much grittier reality. But interesting as it is to see the building, the photo would not have made the cover if it weren’t for the group of students in the background standing on the tower of the School of Mines. We didn’t even notice them until we magnified the image; once we did, we realized that the photo was probably taken after the split with Jarvis Hall and students from the School of Mines hadn’t been invited to pose for the photographer, so they photobombed instead. Whether that’s the truth or not, it’s the earliest photograph we know of that features Colorado School of Mines students, and we are excited to share it with you. Working on this story has given me an even greater respect for historians and the amount of time required to reconcile fragmentary, disparate and contradictory information from the past. Even this relatively short article, aimed at satisfying the curiosity of casual readers, has required a massive effort. For history buffs seeking more, we yield to professionals like Gardner, whose books and manuscripts are piled high in Arthur Lakes Library and elsewhere. Please write us ([email protected]) if your research casts additional light on anything mentioned here. I will read your letters with interest, but I won’t be editing them. After 7 years and 23 issues, I am stepping down as editor of Mines magazine. It’s been an honor to serve the Mines community in this role, which has given me the opportunity to meet so many extraordinary individuals and retell their stories. Thank you for sharing. Thank you for reading. Thank you for your support. Hello Nick…very sorry to hear of your departure from the Editor post of “Mines Magazine”. There are very few periodicals I read cover to cover the moment they arrive. The very positive difference you made in the subjects and quality of the articles will be hard pressed to continue now that you are leaving. But the best of luck and fortune to you and your family. Thank you for your kind remarks and good wishes. Editing Mines magazine was the most challenging and rewarding job I’ve held to date, and your appreciation means a great deal. That said, every issue of Mines magazine reflects the work of many talented writers, designers, photographers, technicians and CSMAA staff members, so any credit must be liberally shared. In particular, Amie Chitwood, who joined in 2011 as managing editor when the foundation generously funded the new position, had a particularly significant impact on the quality of the publication, and the issues I’m proudest of are the ones we worked on together. 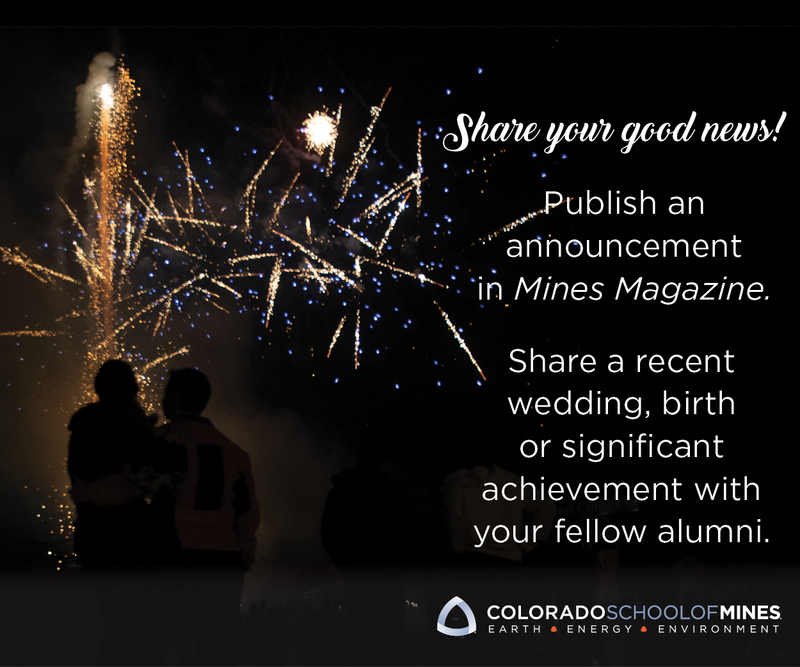 Sadly for Mines, she too has moved on, but I’m optimistic that the publication will continue to engage the community with interesting and informative stories and bring attention to the extraordinary accomplishments of Mines alumni.